La jiao jiang (辣椒酱) is a garnish/condiment used in many Chinese dishes. If you like spicy food, la jiao jiang will become your new best friend. You will hold it and pet it and name it George. You will wrap your arms around it and purr. The name literally translates as ‘hot pepper paste’. You can buy it at most grocery stores or specialty markets, but it’s so easy there’s really no reason not to make it yourself. I made this batch the other day so I could add it to some spicy Lanzhou cilantro noodle soup I’ve been craving for a long time. La jiao is great if there are different degrees of spice love in your house; You can cook with it, but it’s often used as a garnish to finish a dish, allowing everyone to control the heat level to their liking. It’s great for spicing up a soup, a noodle dish, or a stir fry. Mix a little into a bowl of rice (one of my personal favorite late night snacks) or just bring it to the table for dipping dumplings. Make this and become a happier person. Chop the peppers finely or blend them roughly in a mini food processor. Do not discard the seeds. Dried chili peppers can also be used if you rehydrate them. Finely mince the garlic or shallot. Heat oil and a dash of salt in a small sauce pan or wok. Add the peppers and let them sizzle for a few minutes, stirring frequently. Once the peppers have begun releasing their juices and fragrance, lower the heat and add the garlic. After a few minutes add the vinegar (don’t overdo it!) and cover. Let simmer for 10-20 minutes, stirring occasionally, until peppers are dark red and gorgeous. Let cool and store in an air tight glass container. Amounts in this recipe are variable, so feel free to play around, and also larger batches are a great idea if you’ve got the extra hot peppers to do it. Refrigerated your la jiao jiang will keep for 2 weeks or more, but a batch this size probably won’t last that long. If needed, you can also store it indefinitely in the freezer, and separating smaller amounts into plastic wrapped bundles makes it easy to pull out individual portions. Thank you for offering this recipe with free and easy access. I appreciate that you even gave the Chinese name in both pinyin and classical Chinese characters. I’m headed out for peppers now! I literally just made this but used shallot rather than garlic and Apple cider vinegar with Carolina Reaper chili peppers and wow its very nice! HOT but very nice! Thanks for the recipe! I grow my own chilies, so I adopted your version to another kind of chili. With your permission, I quoted the paragraph referring to George but I used the freedom of the translator and renamed one popular name in our country. By the way, I call my own batch “Jolán”, a female given name, Hungarian equivalent of Yolanda. I run a gastroblog, where this recipe appears with a link to your one. Use Google Translate, if interested. Do u know if this can b canned in a water bath to seal? Can this recipe be used in canning? I’ve got to many peppers to make & freeze & was wondering if I could can this using a hot water bath & mason jars? This is awesome! Thank you! xie xie ni ???? Thanks for the nice recipe! Exactly what I was looking for for! Some other recipes I found yielded to large of a batch, and others were not really “Chinese”. Thanks! So I just made this and when I put the ground up chilies in, they burned quite quickly, and I don’t think the heat was all that high. I also had to use extra oil, though I didn’t use a lot of peppers. Maybe I need to play around with oil, quantity, and type of pan? 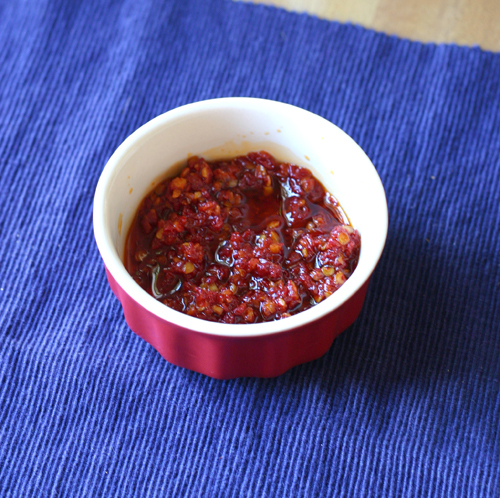 I have been making this kind of chili paste at home for many years. I always make a big batch and can in in jars, boiling water bath/vacuum sealed. I put a lot of Chinese salted black beans in mine, also I use Thai chili peppers and several other types of hot pepper to make the taste and effect more enhanced. Just made a batch of this, using about 15 small red chilis and a mix of garlic and shallots. The air in my kitchen is unbreatheable, but the mixture smells and tastes great. it doesn’t look like yours– the chilis bits are a little dry and the oil separates out and it still clear, but this may change after a few days. maybe i almost burned it? try spreading it into peanut butter–very tasty! I’m going to take a hotplate outside to make a big batch and have some for all winter! Just what I was looking for!